SMOK has done it again with the Majesty 225W TC Kit available in both a carbon fiber and resin construction. The SMOK Majesty 225W Kit is set to blow vapers away with its stylish modern looks and the awesome cloud production. SMOK is constantly bringing innovative vaping mods and tanks to the forefront of the vaping revolution. The SMOK Majesty 225W Kit is a dual battery mod which takes two 18650 batteries, just what you need for some serious cloud production. There are two different editions available for vapers to choose from, the carbon fiber edition and the resin edition. Both styles look modern, sleek, and stylish. 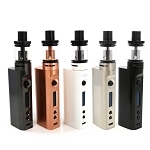 Vapers will also be impressed with the updated user interface of the SMOK Majesty 225W Kit. Itï¾’s easy to use and makes vaping a pleasure, not a pain. Long-term SMOK fans will love the large firing button that SMOK has continued with the SMOK Majesty 225W. They have also added an easily removed battery cover to help make battery charging super easy. 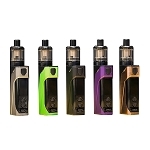 Paired up with the SMOK Majesty 225W Kit is SMOKï¾’s TFV8 X-Baby Tank. The TFV8 X-Baby Tank features an awesome top airflow system that helps produce some massive clouds and intense flavor. The TFV8 X-Baby Tank features SMOKï¾’s classic swivel top cap design that makes refilling your tank a breeze and helps to prevent any spills or leaks. Intense and delicious flavor, massive clouds and some impressive vaping is in your future with the TFV8 X-Baby Tank! 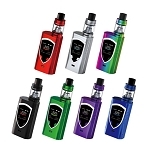 Please note the Majesty 225W Kit requires two 18650 cells that do not come with the device. If you need to purchase these items you can include them with your order by selecting the Add Two 18650 Batteries option above, if you any questions about these products please contact our customer service line during normal business hours for assistance.